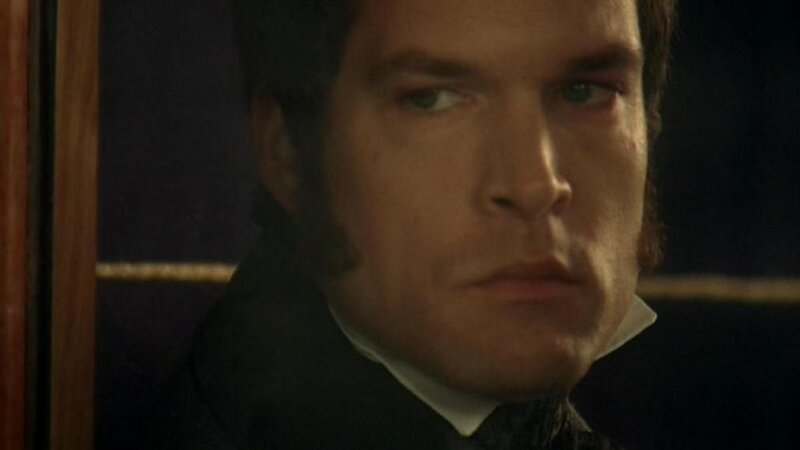 Looking into the character and role of Henry Lennox in North and South can be fascinating and somewhat complex. Are we supposed to like him or not? Is he really in love with Margaret? What is it that makes him just not quite Margaret's type? And then, of course, there's book Henry and then there's film Henry. And how does Henry affect Margaret? What is her reaction to Henry's snide remarks? We can tell by her expression and her replies that Henry has won no points with her at all. It's pretty plain who she is standing up for here in this brief exchange. And it's not the barrister from London. Although this alpha male confrontation doesn't happen at all in the book, this scene from the BBC adaptation still provides an accurate glimpse as to why Margaret isn't interested in Henry as a possible husband -- he lacks depth, he can be arrogant, and he doesn't really know her. Dabblers lack depth. They're not totally committed or wholly involved. 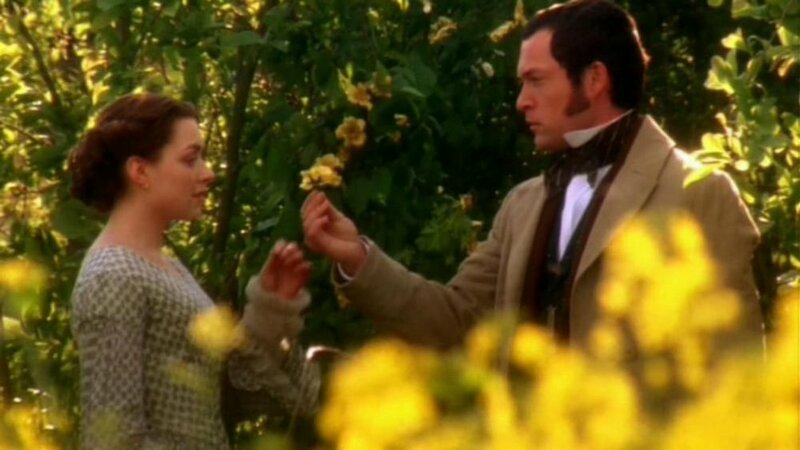 We know with John Thornton, whether in love or in his lifework, -- he's all in. Whatever he does he does with a consuming commitment; when he falls in love, he is shaken to the core. Henry, however savvy and worldly clever, just doesn't have the same substance through and through. He's mostly about doing whatever gets surface results: a good career, the right social circle, the esteem of others. Margaret isn't the only girl that would ever suit him, she's just the first one he's decided who could work really well (he thinks) in his sphere. His casual, flippant manner is revealed in the very first chapter. Margaret is annoyed when he pokes fun at her description of Helstone, a place very dear to her heart. Henry often treats conversation as a social game of wit, no matter the subject matter. It's a habit of his that Margaret finds superficial and cold. Henry's reliance on empty, sarcastic conversation is shown more clearly when he visits Helstone. After he has proposed and been rejected, he finds some measure of recovery from his embarrassment in "a few minutes [of] light and careless talking" with Mr. Hale. Before a quarter of an was over he had fallen into a way of conversing with quiet sarcasm; speaking of life in London and life in the country, as if he were conscious of his second macking self, and afraid of his own satire. Mr. Hale was puzzled. His visitor was a different man to what he had seen him before...a lighter, cleverer, more worldly man, and, as such, dissonant to Mr. Hale. Henry seems to have something of a dual nature -- a Dr. Jekyll and Mr. Hyde complex. When alone with Margaret, he can often be sympathetic and gentle. But, he can change in an instant and become more distant and snidely sophisticated. ...he, not many minutes after he had met with a rejection of what ought to have been the deepest, holiest proposal of his life, could speak as if briefs, success, and agreeable society, were the sole avowed objects of his desires. Oh dear! how she could have loved him if he had but been different, with a difference which she felt, on reflection, to be one that went low -- deep down. Henry's arrogance plays a big part in the way he presents himself to Margaret. One of the reasons Henry seems to switch over to his urbane cynical self is to preserve his pride. He's always posturing to win social acclaim for his cleverness and cool intellectual judgement. And it appears he sees himself as superior to others. "Margaret saw glimpses in him of slight contempt for his brother and sister-in-law, and for their mode of life." "You've no idea what an agreeable, sensible fellow this tenant of yours is....I can't conceive how he contrived to mis-manage his affairs." "With his powers and opportunities you would have succeeded," said Margaret. He did not quite relish the tone in which she spoke, although the words but expressed a thought which had passed through his own mind. Henry doesn't really know Margaret, although he's arrogant enough to assume he does. When he asks her how she spends her days in Helstone, he can't fathom what she could possibly do to fill the time without archery parties, social picnics, or lawn game gatherings. He assumes Margaret needs planned social activity as much as he does. He never seems to comprehend that she does not thrive on the luxury London routine that he enjoys. He even hopes to find that Margaret will have missed her London life when he visits her in Helstone. Not a chance. She loves the freedom of her life in the wide-open country. Henry also makes the mistake of ignoring or underestimating Margaret's strong moral core. His enthusiasm for witty intellect over moral substance actually makes Margaret angry. Even when he does acknowledge her Christian nature, he's rather annoyed with it. And he has the audacity to tell Edith that he wishes Margaret were a little more pagan! If he doesn't appreciate her foundational values and her corresponding behavior, he really should be looking for someone else. ...the clever and ambitious man bent all his powers to gaining Margret. He loved her sweet beauty. He saw the latent sweep of her mind, which could easily (he thought) be led to embrace all the objects on which he had set his heart. Henry's looking for a girl he can mold to his personal requirements. He's assuming his marriage will take on the traditional pattern, where the wife is subservient to her husband's wishes. The fact that Henry can believe that Margaret will be happy conforming to this model is the final proof that he doesn't really know her. Margaret shows no interest in following the customary path of making a comfortable life in the pursuit of wealth, ease, or social acclaim. She wants to actively engage with the world outside her comfort sphere. She is looking for a life of purpose -- a way to help others. Henry's pursuit is to project himself onto the world, to find satisfaction in pleasing himself according to all of society's standards of success. Margaret and Henry want different things. They're following two different paths. Margaret realizes this, and knows she will never marry him. Henry doesn't see this, and blindly believes he's slowly winning her over. Now of course Henry isn't really a bad fellow. I give credit to Henry for being attracted to Margaret in the first place. There are times Henry is a good friend to Margaret, when he isn't being so concerned about his own self-image. But his focus on self and worldly gain and satisfaction is just so very -- typical. Henry is following the crowd in his life habits and desires. His quick wit and keen intelligence are not enough to commend him. He's far too focused on Henry and how Henry appears to the world. 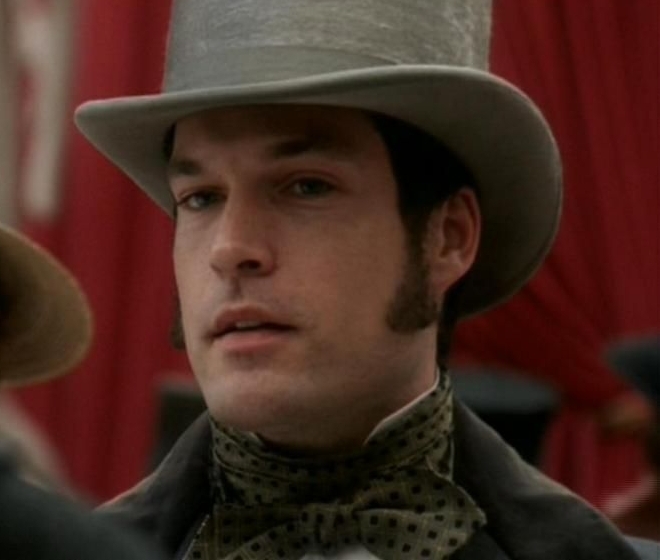 If we take a broad look at Henry Lennox's role in North and South, we can see how Gaskell uses him to bring out various facets of Margaret's character. And, of course, Henry is a striking foil for John Thornton. The contrast between the two men shows us exactly what Margaret is attracted to and what repels her. And now -- at long last, we need to take into account the overriding reason why Henry will never do: the lawyer from London could never combine the passion and tenderness in one kiss that one lonely Milton master could -- and did. Henry discovers the real reason Thornton is called "the master." The real problem with Henry? He's just not John Thornton.